On November 16th, Syamesvari the cow gave birth to a beautiful baby bull calf. The community is truly blessed to have such a special soul offer us his association. Check out this link to see a video of the calf and his mother. 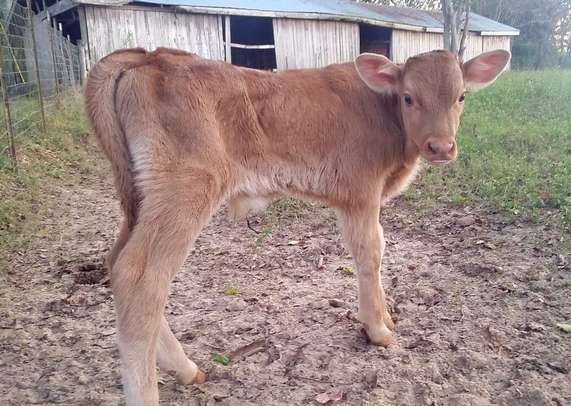 His mom is a pure Guernsey, and the father bull is a Jersey-Guernsey mix. The calf is big for a newborn, and he has an especially thick coat of fur. As expected, he’s adorable. He’ll be spending the next month or so strictly with his mother, who has been known to get a little rough with people (she’s nicknamed Crazy Cow for good reason!). So be sure to contact us ahead of time if you’d like to visit the baby calf. We are currently seeking someone to sponsor this amazing cow. If you’d like to receive Krishna’s special mercy by sponsoring, please contact outreach@newtalavana.org for more information about our Adopt-a-Cow program.